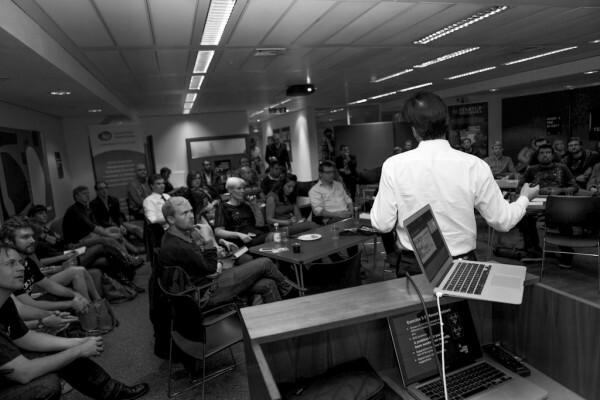 The second Converge+UK event was held at the Innovation Warehouse on 3 October 2012. 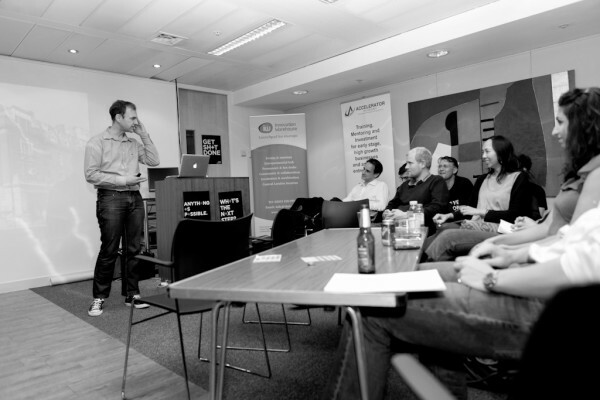 We had over fifty people attend from a mix of design, business and technology backgrounds. The mash-up of backgrounds made for some great debates and discussions. 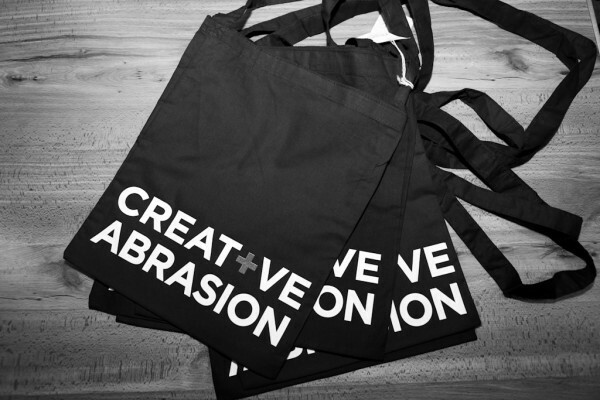 Creative abrasion is one of the main themes of Converge+UK. The Converge+UK team are getting better at dressing the room to create a sense of occasion. Our branding is getting so good that we even had a few attendees try and (jokingly) steal the event posters at the end of the night. We’ll be making PDFs of the posters available on the Converge+UK website. The Converge+UK visual system has allowed us lots of flexibility to tell new stories at each event. Sallie, David, Klaus and myself had a lot to cover on the night because we really wanted every attendee to feel like Converge+UK was personally relevant to them. This means we were on our feet most of the night introducing people to each other and prompting creative abrasion. We also had a couple of great event photographers with Peter Alberti (who’s shots are featured here) and Dan Wong both shooting on the night. The Converge+UK format includes prompts for group discussion and some icebreaker excersises. At the Innvoation Warehouse event we used the “BYO Problem” technique where attendees bought along a real-world problem then discussed it with a group from totally different professional backgrounds. This prompted some good creative abrasion and it was fun to see the room buzzing with conversations about real business issues. Some people blew off the exercises and hung out at the bar. The group discussions are a key part of the Converge+UK experience. We also repeated the “How do you describe what you do to your mum?” exercise from the launch event. This is always popular because a lot of professions that fall under design, business and technology have become so specialised that it’s pretty confusing to describe them to anyone. My mum came to the event and I’m still not sure that she understands what I do. Carl shared some personal stories about the convergence between professional disciplines. Carl used to work in a high-powered corporate job before a chance encounter bought him into the orbit of a natural healer. The two struck up a firm friendship that resulted in some hilarious examples of different world-views colliding. A crowd favourite was the KPMG accountant who was convinced to try out a raw food diet but was suspicious about whether the food was spiked, because it made him feel so much better than his previous diet. Carl at Converge+UK telling a story about the overlap between professional disciplines. Carl is a great storyteller and really took us on a journey with him from Sydney to Slovakia, New York and London. His startup Pondera is a great example of the Converge+UK spirit of bringing people together from different backgrounds. 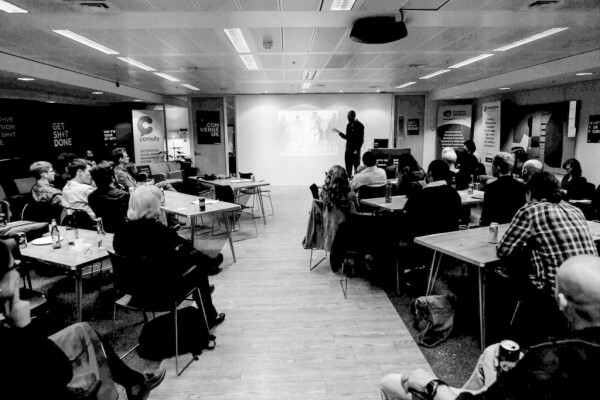 Mat talked about the real story behind his data visualisation and social media analytics. Mat speaks on a lot of panels at Social Media industry events so I was excited to see him have the stage to himself and have a mandate to talk out-of-school about a topic that he’s passionate about. Mat showed us how he had personally hacked together a number of statistical tools to do his own graphing and data visualisation. He self-effacingly called his style of coding “Cargo Cult Programming” because he was copying code from a variety of sources (sometimes without fully understanding it). Nevertheless, he has successfully managed to use data visualisation and statistics to better understand behaviour on Facebook and Twitter. For example, Mat has managed to put numbers around the common intuition that posts on a page by the page owner generally get more reactions than posts on a page by a fan. These insights are important for community managers and owners of Facebook pages. The audience loved Mat’s discussion of data visualisation. One of his great tips was to keep an eye on ASOS because their e-commerce focus has made them fast to adapt and iterate on social media. He talked about the misguided way that some brands spend money on their Facebook page designs and rather than the individual pieces of content that are shared in the stream. Mat is one of the original advisors that got us started with Converge+UK and introduced us to Alfie Dennen who spoke at the Launch Event at Google Campus. Several audience members have demanded to see more from Mat so we’ll hope to have him on stage again in the future. We launched the Five in Five format at Converge+UK. The 5-in-5 style of presentation gives speakers five slides to deliver in five minutes. The slide progression is controlled by a sympathetic (but firm) moderator who senses the energy in the room and works with (not against) the speaker to get through the presentation in (or close to) the allotted time. Being a bit more flexible with timing allows the focus to be on the content not the format. The short, punchy style of Five in Five lends itself well to presenting a personal creative project, an anecdote about business or the lessons you’ve drawn from an unexpected source. Our crash-test-dummy speakers all gave great presentations. Jono delivered the first ever five-in-five presentation. He shared five examples of things that we can learn about creativity from movie westerns. This was a perfect start to the format because Jonathan is an advertising creative who can tell a story and connect some pretty random dots together into a seamless whole. 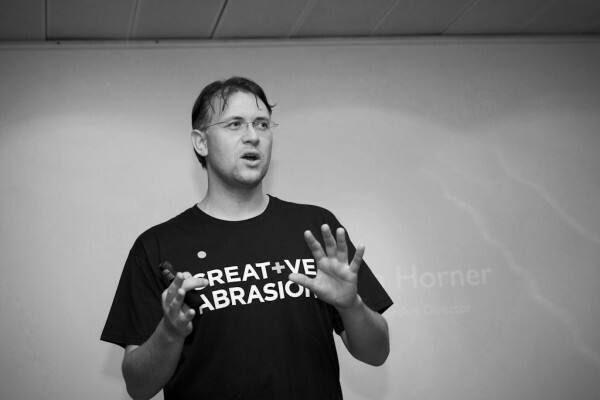 Jonathan Horner told us what we can learn about creativity from western movies. The audience loved the encouragement to look for inspiration in failure. Jono told us how the box office flop ‘The Valley of Gwangi’ (featuring cowboys and dinosaurs) has since inspired dozens of directors who have copied shots and scenes from the movie and given it a whole new cult appeal. Alex talked about his time in Vietnam helping develop e-commerce and online retail. He had some great cultural insights to share. He had learnt a lot about how to hit the ground running and how to blend into a new culture. Rob spoke about using real human emotions in design. He shared the example of blind athletes who showed the same facial expressions as sighted athletes in the same situations at the Olympics. Everything from winning a gold medal to loosing a match evoked similar emotions, and those emotions were then expressed through remarkably similar facial expressions (given that the blind athletes couldn’t have learnt them externally). The point being that facial expressions may prove to be a very accurate (and culturally universal) way of understanding someone’s emotions. The 5-in-5 format seemed to work well so we’ll certainly try it out again. We’re always evolving the Converge+UK events so we’re keen to hear more feedback. You can keep up to date on the Converge+UK Facebook page and the Converge+UK website. Sam Lynas also had some great comments about the event on his blog. The Innovation Warehouse was a great venue and it was fun to see inside another startup incubator. Several of the startup in the Innovation Warehouse came to Converge+UK so it was good to get to know them. Luisa Morales, from the Innovation Warehouse team was a wonderful host. Our catch phrases of GET SH+T DONE and CREATIVE ABRASION are starting to get noticed around Shoreditch so keep an eye out for stickers, posters and more t-shirts. If you came to the event or have any suggestions for future events then let me know in the comments below or on the Facebook page for the group. I am a visiting professor from Temple University in Philadelphia, USA. I’m teaching a class in creativity and innovation to a group of study abroad students in London and this week, coincidentally, our topic is “creative abrasion”! 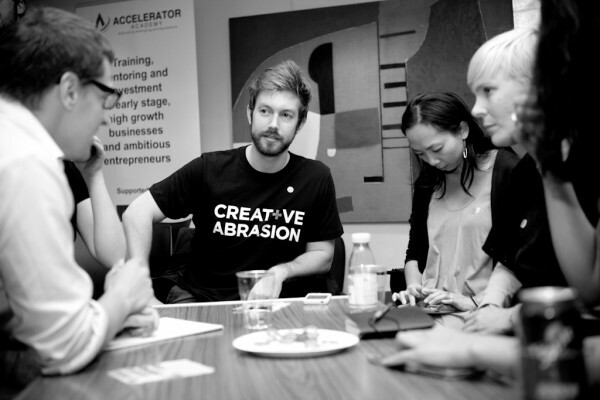 Any chance I could convince you to come to visit my class and talk about how you’re using creative abrasion?